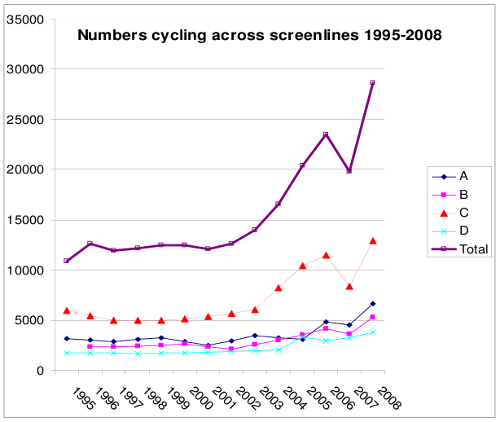 The latest update from Spring and Autumn 2008 shows a positive growth in cycling. Between 2007 and 2008 there has been an increase in numbers cycling by 44.6% and the estimated modal share for cycle use is 11.19%. An impressive achievement that is rightly celebrated. Camden repeat it in their more general transport reports as the take-home-message on cycling. Cycling fell by 16% between 2006 and 2007 which was out of line with the longer term trends. The recent data has indicates that 2007 was a “blip” year with 2008 showing cycling increases and the overall trend back on track. Fancy that. This is how cycling revolutions are made. Seriously, though: these kind of numbers matter, because basic data on cycling demographics are needed if, for example, medical statisticians are to be able to comment on why we see the patterns that we see in cyclist death and injury. I don’t necessarily think that collecting that sort of serious data is something that we should be expecting overstretched borough and district councils to do. But there isn’t anyone else.